It’s been said that necessity is the mother of invention. I think it’s true. Although many of our inventions make me wonder if I really *NEEDED* them in my life. For example, we went through a period cooking-wise when the finishing touch to a dish always involved wrapping it somehow in bacon. Delicious, but we certainly did not NEED the extra bacon-y goodness. I need to find a way to get Little Bread Baby (soon to be Little Bread Toddler) to eat a whole ton of rice. Mr. Bread Maiden decided that LBB was not getting enough carbs in his diet, so he made a big vat of brown rice and then left town for four days. LBB was not impressed with the rice. What to do? With Mr. Bread Maiden out of town, I didn’t have a ton of ingredients or motivation to acquire ingredients. I had a bunch of eggs and a bunch of rice. Ok, that’s getting there. I don’t have the bread crumbs or ricotta though. But now I have a name for what I’m looking for. 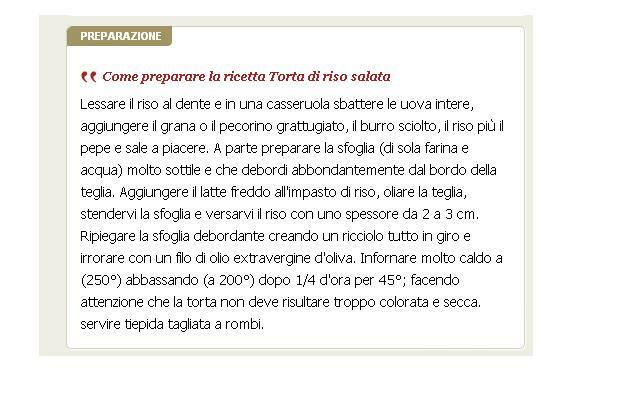 Torta di Riso. I guess that’s ok. My knowledge of other romance languages can help me figure out most of it. However, now I’ve come to another problem. 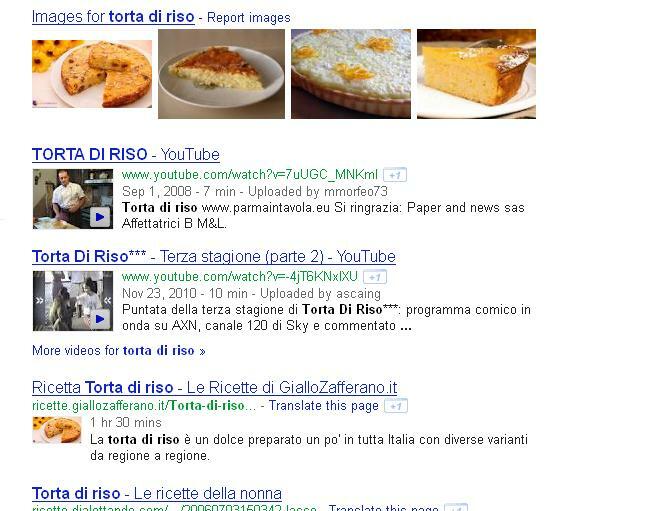 All of these Tortas di riso are sweet. 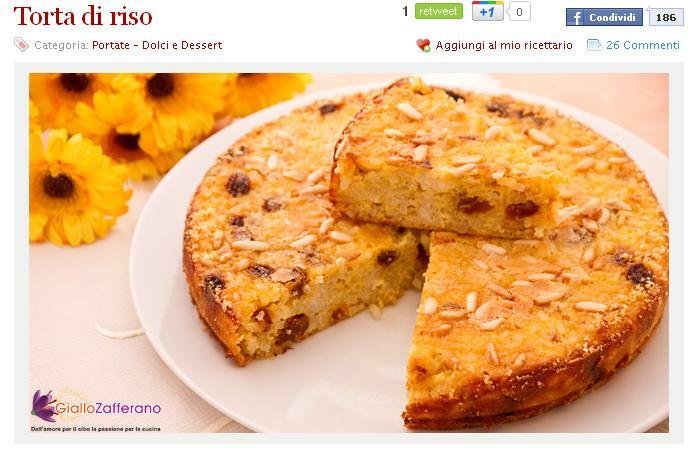 This is a perfectly lovely torta di riso with raisins, but not really what I’m looking for. Not to worry. Since I want something savory, I added “salata” at the end and tried again. The recipe itself is where things get tricky. My Italian is simply not good enough to parse this one out. So I employed the help of Google Translate. “The cake should not be too colorful.” Ha. 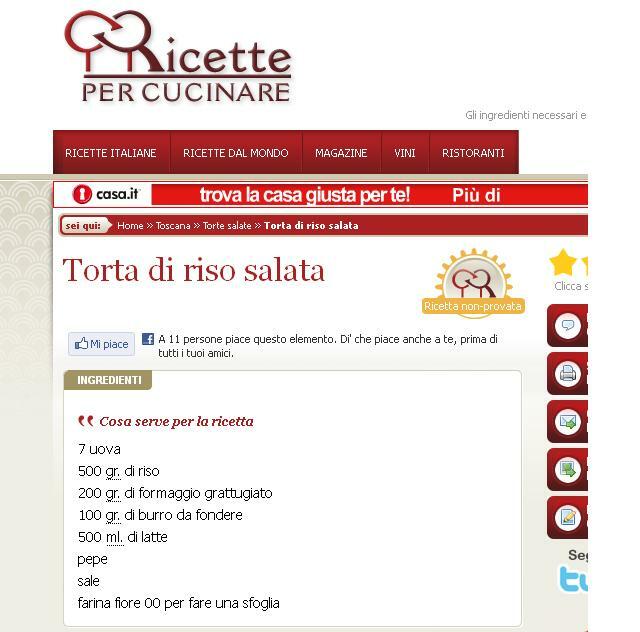 Using this translation as a guide, here is the final recipe I used. This recipe calls for a pie crust but I didn’t use one. P2. Put rice in a mixing bowl. 33. 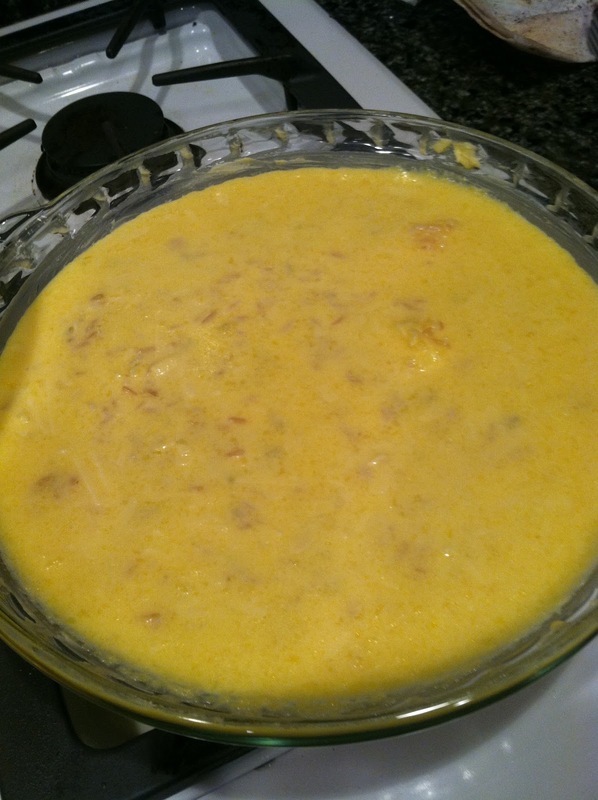 Beat the whole eggs, then add them along with the grated cheese, melted butter, pepper and salt to the rice. 44. 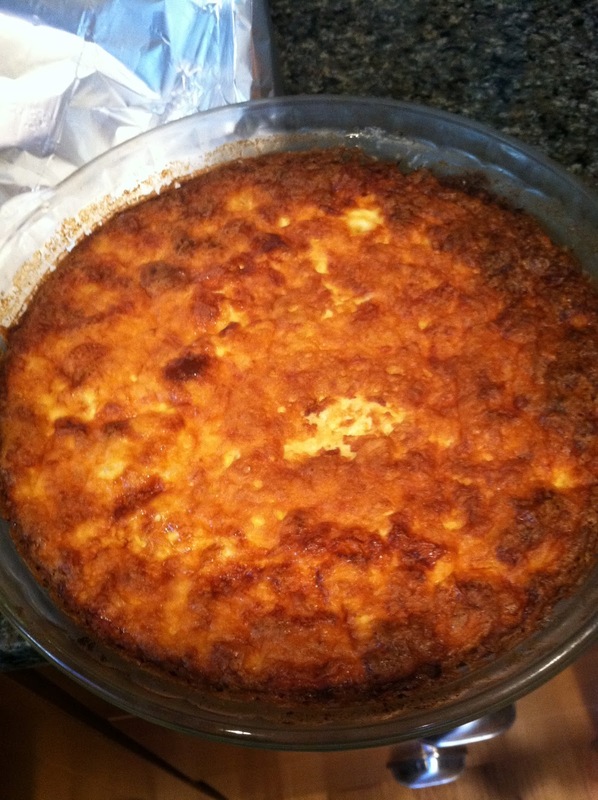 Add the cold milk to the rice mixture, then pour into a greased pie pan. At this point I was a little nervous that it was going to be too runny and not set properly. 5.5. Place the pan in the oven, then turn the temperature down to 375 after 15 minutes. 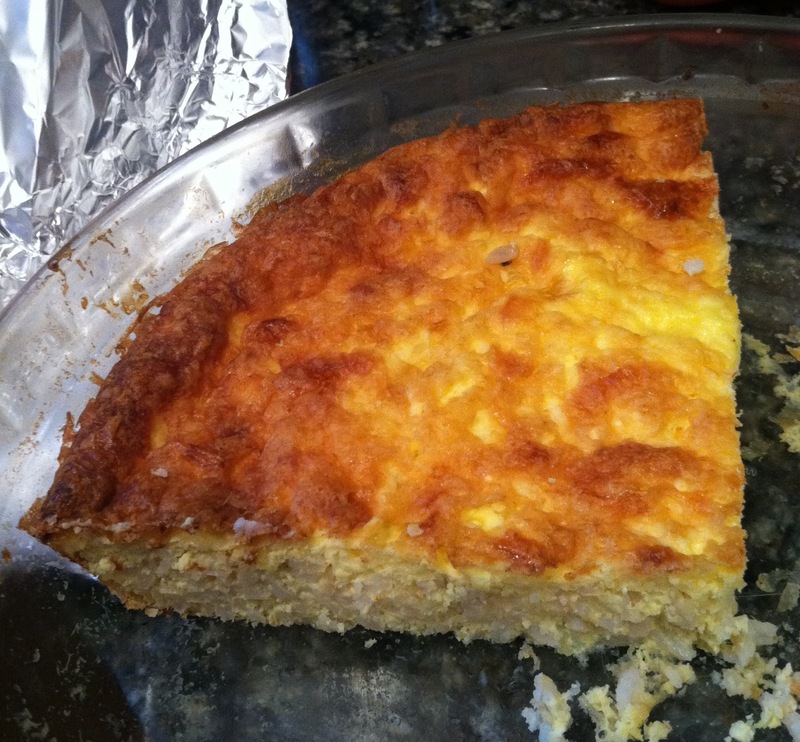 Continue baking for another 45 minutes or until brown and crunchy on top. Serve warm. I didn’t have anything to worry about. 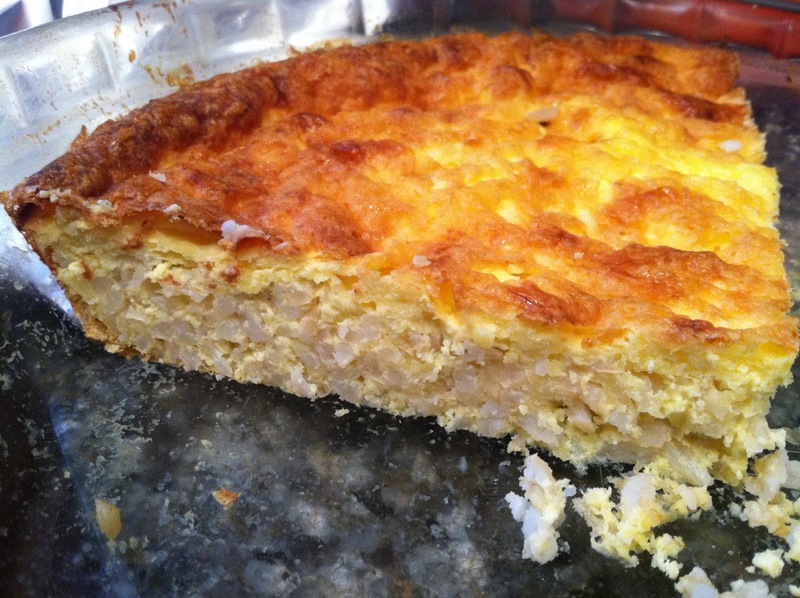 The rice pie ended up delicious. Once it cooled, it became very easy to slice. Most importantly, LBB LOVED it. Look at all that rice I used. 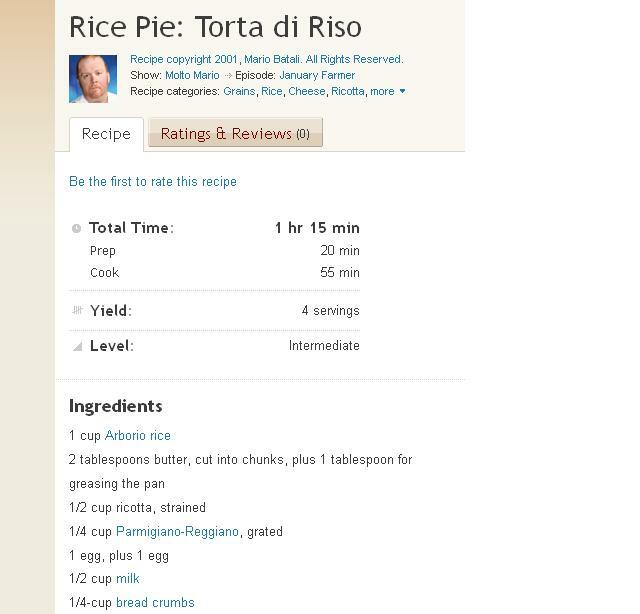 The recipe called for ALL of the rice (I’m guessing I had about 4-5 cups of cooked rice) to make two pies. I think next time, if I want to make the recipe for grown-ups, I will add more seasoning or vegetables. It’s a little bland. So, in conclusion, creative use of the internets can result in a nutritious meal with a few staple ingredients. I don’t think I would make this if I didn’t already have a TON of cooked rice lying around, but since I did, it was easy to whip up. Before I go, I’ve been asked to provide links to screenshots I publish here.